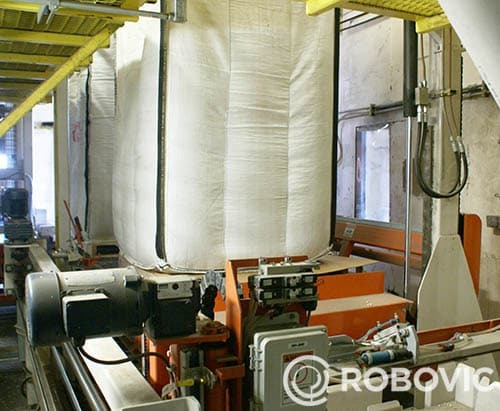 Semi-Automatic Tote/Bulk Bag Filling System | ROBOVIC Inc. 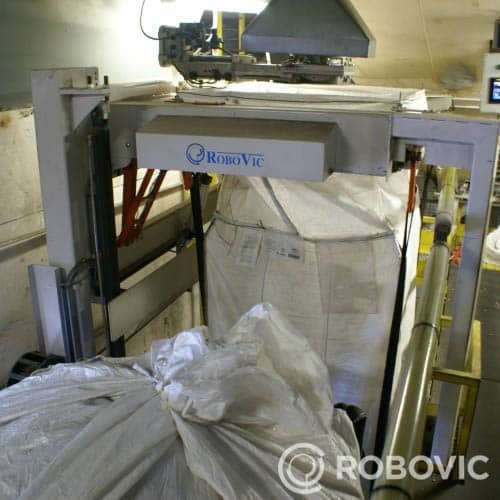 The semi-automatic bulk bag filling system is an economic and efficient way to fill and handle bulk/tote bags. This system was developed to handle products such as: grains, powder, aggregate, granular products. The semi- automatic bulk bag filling system optimizes and reduces bag changing time, significantly increasing filling speed. The filling station enables the operator to position bags easily and quickly, as the four straps are hooked in the front of the system, preventing operator from leaving the station to hook bags. 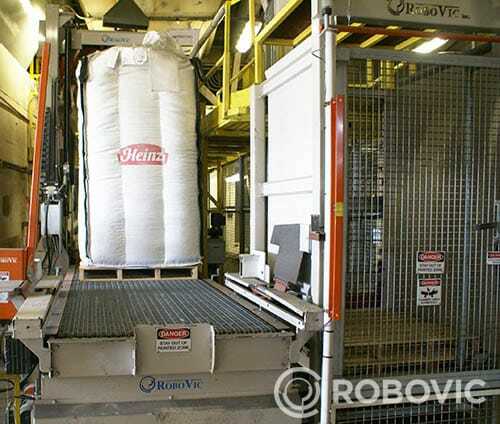 During the process of automatic filling, an integrated weighing system ensures weight precision of each bag. The design of the work station allows operator to close bags while the next bag filling takes place. The bag is automatically unhooked and the operator can hook a new bag, reducing filling interruption. The production speed of the bulk bag filling system is 15 to 20 bags per hour, varying on type and weight of product. These systems distinguish themselves by their efficient and ergonomic configuration and their optimized production speed flexibility. In order to reduce manual labour, the bulk bag filling system can integrate numerous options such as: tagging, wrapping, printing and feeding of automatic pallets. Easy and simple bag changing. 25o kg to 2 tons bags. up to 15 to 20 bags per hour. Manipulator for stacking 1 to 4 bags per pallet.